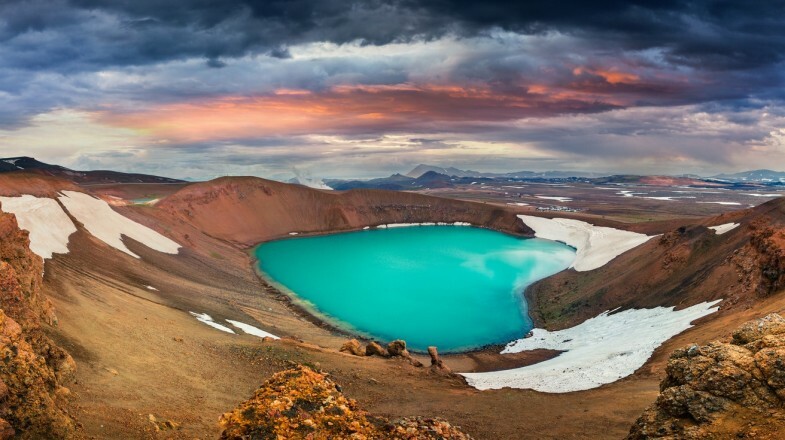 Few places on earth feature such stunning landscapes and biological diversity as Iceland’s Lake Myvatn. This shallow lake and the wetlands around it is almost a world in itself, full of natural wonders waiting to be explored. With so much to see in and around the Lake Myvatn area, it can be quite overwhelming to plan a visit. We’re here to help and to share some general knowledge about the area and the top 10 things you simply must do when visiting Lake Myvatn. The Lake Myvatn area abounds with beautiful, unique scenery. On one side of the lake, you will find jagged, rocky lava fields; on the other, you can run through lush, vibrant fields of green. Lake Myvatn is home to an impressive abundance of wildlife. Over thirteen species of ducks nest in the area, along with many other rare birds. If you’re an avid birdwatcher, be sure to visit the area in the summer time as most of the birds are migratory. This area was created following a lava eruption from a fissure over 2,300 years ago, and it continues to be a sight of active volcanism. 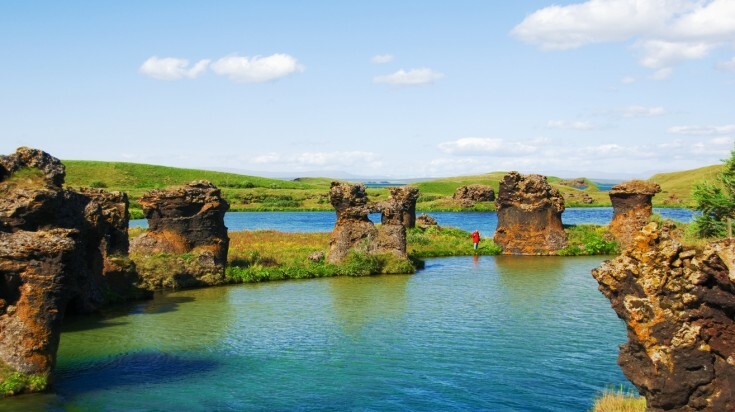 In fact, the area surrounding Lake Myvatn is distinctively covered in lava pillars and pseudocraters. Summer travelers beware — the name “Myvatn” is Icelandic for “midge lake” as the area becomes infested with midges (small flying insects) in the warmer months! (A small price to pay for the incredible scenery, if you ask us). Looking for a unique way to explore Lake Myvatn? Instead of driving around the sites, park your car and hire a bike or a horse instead. For a relatively inexpensive fee, some tour companies can even arrange a flight over the area in a plane! 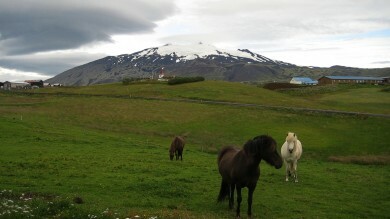 If you want to rent a car, then please do check out these tips on hiring a car in Iceland. A caldera is a large depression created in the Earth’s surface, often compared to a cauldron. At 10 km long and 2 km deep, the Krafla Caldera is a collapsed volcanic area that was created from the Krafla Fires in the 1970’s. It is worth visiting, particularly for views of Víti Maar, a beautiful crater lake of about 300 meters in diameter and filled with unusually teal green water. 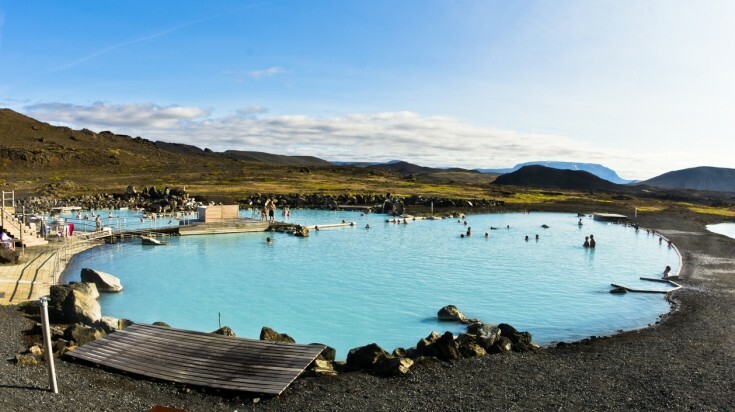 If you really want to tick swimming in an Icelandic hot spring off your bucket list but don’t want to deal with the tourist crowds of the popular Blue Lagoon, the Myvatn Nature Baths are a great alternative. The lagoon is fed by a nearby basin, containing around 3.5 million liters of water that has been cooled to 36 – 40°C — perfect for swimming around with a pint of beer in hand as you let the naturally warm waters soothe your muscles. 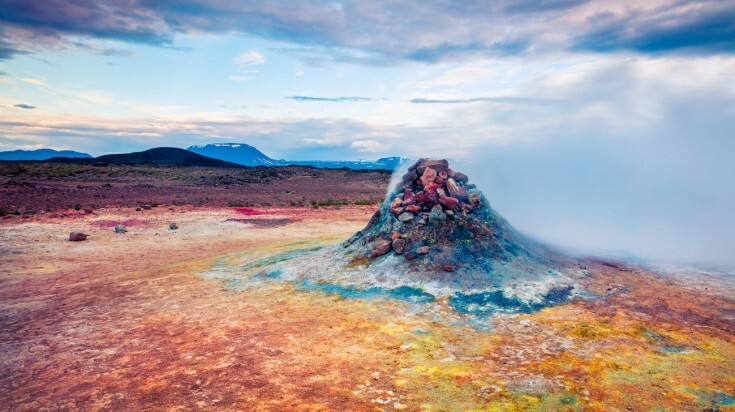 Don’t let the smell of eggs put you off – these sulphur springs are an incredible sight. With mud so hot that it actually boils and bubbles above the ground, Hverarond is one of Iceland’s largest sulphur springs. 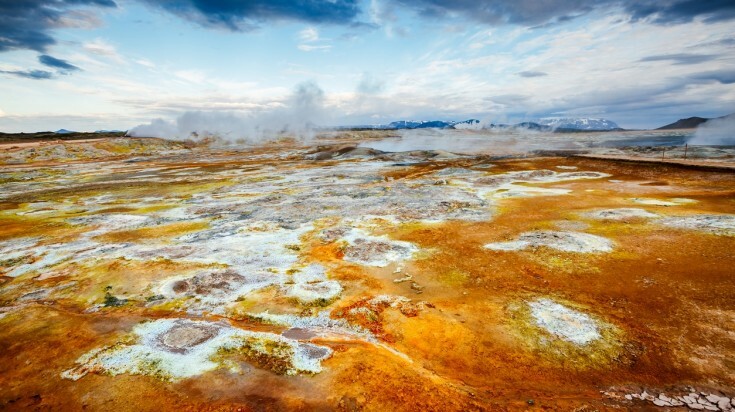 Be sure to spend some time walking among these interesting springs across the burnt-looking yellow earth. Unlike many hot springs in Iceland, however, Hverarond is far too hot to go swimming. Do be careful not to burn yourself as you explore. 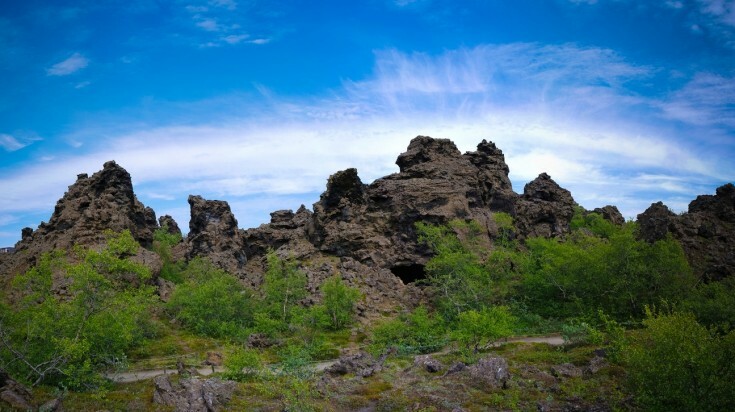 The Dimmuborgir lava field is scattered with dramatic lava rock structures that are said to not exist anywhere else on land (similar structures were found beneath the sea near Mexico). Like many places in Iceland, a walk among these formations will make you feel like you have stepped onto another planet! Find a way through ‘the dark fortress’ as you stumble among lava pillars, caves and tubes. On the other side of Lake Myvatn, just opposite the Dimmuborgir lava fields, you’ll find the Hofdi Lakeside Walk. Quite a dramatic difference in terms of landscape, this side of the lake is serene and lush, featuring forested areas and green pastures. Follow the trail for incredible, photo-worthy views of the lake and its surrounding area. 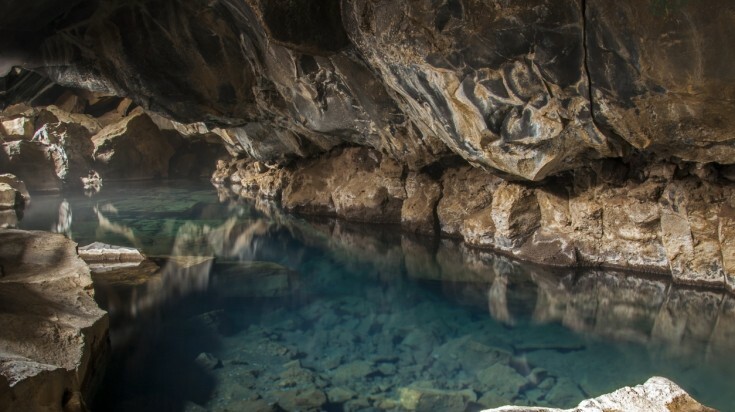 Near Lake Myvatn, you can explore two geothermal lava caves — Grjótagjá and Stóragjá. These caves were once used for private bathing; however, the waters in the caves’ natural springs rose to above 50 °C following eruptions in the area in the late 1970’s and early 1980’s. While you may not be able to swim in their waters, the magical caves are still well worth a visit, particularly for Game of Thrones fans, who may recognize Grjótagjá from the episode ‘Kissed by Fire’ in season 3. Admit it, this is something you have always wanted to do! 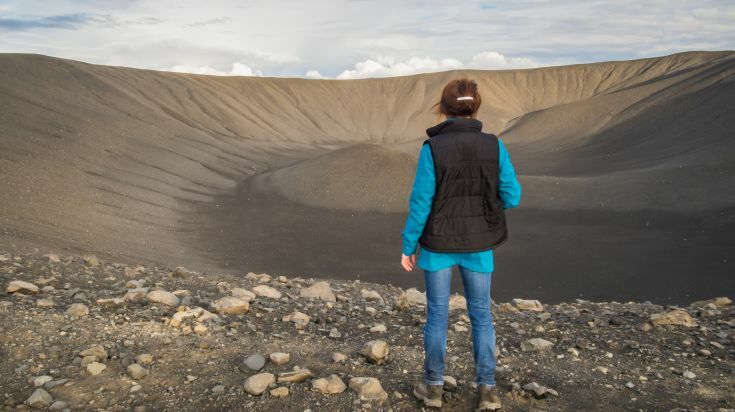 Not far from Lake Myvatn, you’ll find the Hverfjall Crater, one of the world’s best preserved volcanic craters. Standing at 396 meters high, the crater can be reached by a short hike of about 15 to 20 minutes. Once there, it would take you just over an hour to walk around the 1 km wide circumference! Soak in the incredible views of Lake Myvatn and the Dimmuborgir lava formations. Don’t worry about activity, the crater hasn’t erupted since 2500 BP. Even those who are not interested in bird watching will find there is something interesting about the Bird Museum, built in honour of Sigurgeir Stefansson, an avid collector from the local area who sadly passed in 1999. Take the time to learn about the area’s diverse wildlife through the museum’s extensive collection, which includes 330 stuffed birds and a variety of eggs. Try your luck with the museum’s telescope to see if you can spot any rare birds in the area. Often served with smoked trout caught fresh from Lake Myvatn itself, Hverabrauð is a dark, rye-like bread that is baked in the local area using the ground’s geothermal heat. This is a traditional Icelandic bread and not all Hverabrauð recipe is the same. The dough is made and put into empty milk cartons that are then buried in the ground at the edge of the hot springs for about 12 hours. Most cafes and restaurants in the lake area will have Hverabrauð on their menu, so be sure to give it a try! If you are a food lover, check out some of the ‘must try’s’ Icelandic food. Not far from Lake Myvatn (about 78 km) you will find Dettifoss, the single most powerful waterfall in all of Europe. 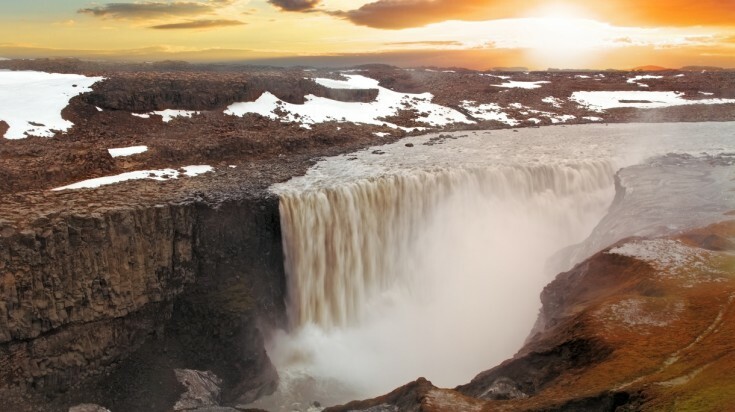 Sometimes called “the Beast” (in comparison to Godafoss, which is often called “the Beauty”), Dettifoss is wedged between steep rocky drops and gushes at a rate of about 96,500 gallons per second. Yep, you read that correctly — per second. In fact, the waterfall’s 45 metre drop (as high as the Statue of Liberty) is so powerful that its mist can often be seen from miles away. Many tours of the Lake Myvatn area include a visit to Dettifoss. Check out other beautiful waterfalls in Iceland that are worth a visit! The most powerful waterfall in Europe, the Dettifoss Waterfall has an average flow-rate of 193 m3 per second!